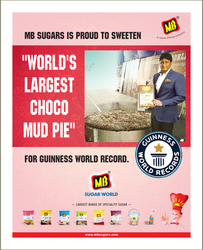 MB group had partnered with ‘The Prince of Chocolates ’, celebrity chef Varun Inamdar to c reate Guinness record his tory on August 3, at Dr Shyam a Prasad Mukherjee Stadium, Taleigao, Goa. The group together with celebrity chef Varun Inamdar had attempted the Guinness World Record for creating the largest chocolate mud pie weighing one tonne with a diameter of over 6 feet. The challenge which was led by Inam dar included many chefs from Goa and culinary profess ionals and was done on August 3 at Trinity ’s flagship showcase – the 15th Annual India Hospitality + F&B Pro International Expo 2019. We are in the business of specialty Sugar since 1997 and catering to Food, Bakery and Hospitality Industry. Thus it comes naturally to us that we should aim at a record related to food. The reason we chose a chocolate mud pie this time around is because Goan's love sweets and desserts,” says Marketing Direc tor Mr.Sam yak Lodha. The current record for the largest chocolate mud pie was set at 500 kilograms. “We dec ided that instead of just barely breaching the benchmark, we should breach it well and thus decided to attempt double the weight. In this way, the record will hopefully s tay for a long time,” say s Mr. Lodha. Over 2200 pounds (1000 Kgs) of ingredients were used into making the mud pie, which included Castor Sugar & Icing Sugar sponsored by MB Sugars. A specially fabricated vessel and oven of 8 feet was designed by M r.Pradeep Panchal of Kitchen Mall over the last 18 months. This has been electrically coiled. Mr. Nitin Deore (Consumer Product Division H ead) and Mr. Hidayat (Mumbai & Goa Bakery Bus iness Head)from MB were present for the event. “There is a lot of mixing, cutting involved and there were plenty of chefs joining in. We also had people from Goa University, Agnel Ins titute Of Food Crafts & Culinary Sciences among others and getting all these s takeholders together was a challenge” says Mr. D eore. After serving the mud pie to the audience, the rest of it was then distributed to various charities around Goa through the Food Bank for the Poor, Sangolda.